Vitamins & MineralsScitec Jumbo Pak - 44 sasz. Scitec Jumbo Pak - 44 sasz. The most advanced range of micronutrients and active ingredients supporting the development of muscle mass and strength, a supplement designed for high-performance athletes. Bet on the best and deliver himself of all the necessary vitamins and minerals! STRONG MULTI–VITAMIN & MINERAL TABLET! EXTRA VITAMIN C FOR NORMAL IMMUNE FUNCTION WITH ROSE HIPS! EXTRA CALCIUM AND MAGNESIUM FOR ENERGY AND MUSCLES! ”KREBS CYCLE–ATP“ MATRIX WITH 3 TYPES OF CREATINES! FULL–SPECTRUM AMINO TAB AND EXTRA BCAA'S! SPECIAL AMINO MATRIX WITH TYROSINE AND ORNITHINE! NITRIC OXIDE (NO) PRECURSOR L–ARGININE! J–X COMPLEX WITH GLUCOSAMINE, CHONDROITIN AND EXTRA MSM! CARNI COMPLEX WITH TWO FORMS OF L–CARNITINE! NON–STIMULANT, CAN BE USED ANY TIME! 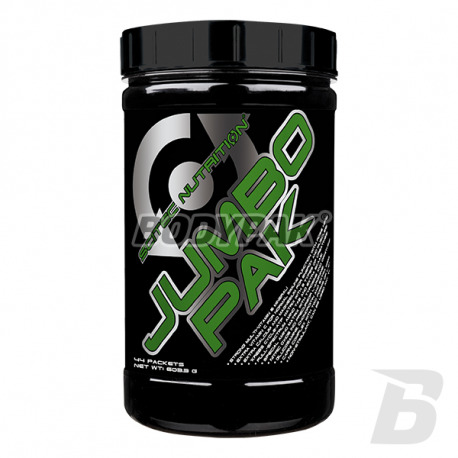 JUMBO PAK is a top multi-vitamin and mineral based “training pak” with numerous extras! Vitamins and minerals are very basic essential nutrients that must be adequately taken in for optimal health and high level sports performance. Our multi-vitamin tablet is strengthened by the addition of a Vitamin C, Rose Hips + Resveratrol capsule, and a Calcium-Magnesium tablet. Vitamin C contributes to the normal function of the immune and nervous systems, and to the reduction of tiredness and fatigue*. It also helps to maintain the normal function of the immune system during and after intense exercise (the beneficial effect is obtained with a daily intake of 200 mg in addition to the recommended daily intake of Vitamin C)*! Calcium and Magnesium contribute to normal energy-yielding metabolism and to normal muscle function*. A full spectrum amino acid complex is responsible for the supply of essential aminos including BCAA’s. 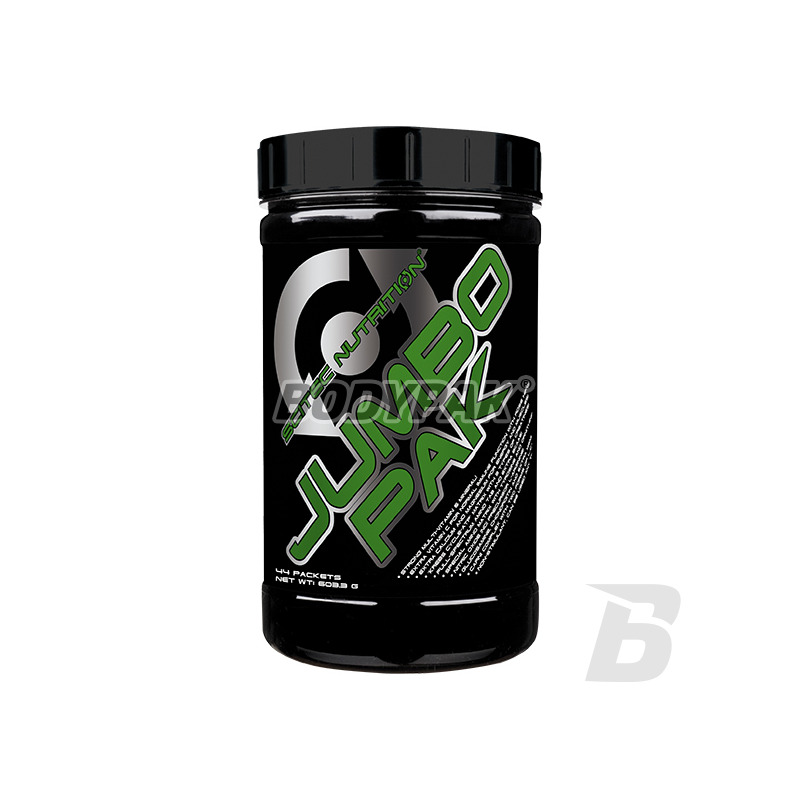 An extra BCAA Complex is added to increase the complexity of the formula, and also the Nitric Oxide (NO) precursor L-Arginine besides L-Ornithine, L-Lysine and L-Tyrosine. Different forms of L-Carnitine and Creatine are also parts of the our JUMBO PAK, and so is a Glucosamine – Chondroitin – MSM complex! Take 1 packet a day 30 minutes before training. On rest days take 1 packet with breakfast. Use this product in conjunction with food as part of a healthy, balanced diet, not as a substitute for such. Ingedients: Ascorbic acid, Calcium carbonate, Dl-Alpha-tocopherol acetate, Capsule shell (Beef gelatine: Candurin fine silver, BN black, Black titanium oxide), Rosa canina extract; Magnesium oxide, pyridoxine hydrochloride, D-pantothenate calcium, Polygonum cuspidatum hydroxide, Thiamine hydrochloride, Riboflavin, Amid niacin, Ferric fumarate II, Routine zinc sulphate monohydrate, Choline quinate, Carrier (magnesium stearate), Vitamin A acetate, D-biotin, Manganese sulphate monohydrate, Sodium sulphate, Hesperidine, Inositol, Cyanocobalamin, Colecalciferol, Copper sulfate pentahydrate II, Folic acid, Potassium iodide, Sodium bicarbonate. Composition (Ca-Mg Tablets): Oyster Shells, Calcium Gluconate, Magnesium Oxide, Magnesium Gluconate, Thickening Agent (Cellulose Plant, Croscarmellose), Coating (Cellulose), Dye (Titanium Dioxide), Anti-caking Agent (Vegetable Magnesium Stearate). Other Ingredients: Capsule Shelf (Beef Gelatin, Color: Candurin Fine Silver (E171, E555), Brilliant Black BN, Black Iron Oxide), Anti-caking agent (magnesium stearate). Other Ingredients: capsule shell (beef gelatine, dye: titanium dioxide). Other Ingredients: Carriers (Magnesium Stearate, Tricalcium Phosphate, Dextrose), Capsule Capsule (Beef gelatine, Candurin silver fine (E171, E555), Chlorophyll copper complex). Other Ingredients: L-carnitine tartrate, Acetyl L-carnitine HCl, Capsule capsule (Beef gelatin, Candurin fine silver, BN black, Iron oxide black), Anti-caking agent (Magnesium stearate). Other Ingredients: carriers (microcrystalline cellulose, talc, colloidal silicon dioxide, magnesium stearate). Other ingredients: whey protein concentrate , carriers (microcrystalline cellulose, talc, colloidal silicon dioxide, magnesium stearate). Witaminki i minerały.. saszetki - coś mi to przypomina :).. formuła jednak jest ciekawa i nie dopatrzyłem się większych mankamentów. Wszedłem ostatnio w okres bardzo ciężkich treningów i przygotowań do zawodów. Regularne uzupełnienie witamin stawiam zawsze jako priorytet - bez tego ani rusz. Jumbo Pak sprawdza się w tej sytuacji bardzo dobrze! Jednak produkt dla osób, które trenują rekreacyjnie raczej zbędny. Potężna dawka witamin i minerałów i jednej saszetce. Dobrze się sprawdza przy dużej aktywności fizycznej tak jak u mnie, przy dwóch a nawet trzech treningach dziennie. O wiele lepiej się regeneruje! Advanced formula based on a mixture of B vitamins, folic acid, vitamins C, E and minerals (zinc, biotin and calcium). Very well-assimilated chemical forms and excellent proportions of individual micro and macronutrients! World quality at a good price.